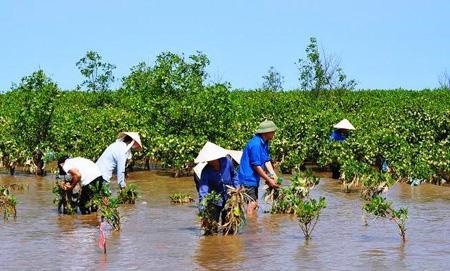 HÀ NỘI — Prime Minister Nguyễn Xuân Phúc has green lighted the target programme to cope with climate change and promote green growth during 2016-20. The programme is designed to improve local residents’ abilities to adapt to climate change, boost green growth and transition towards a low-carbon economy. The programme includes four components: implementing some targets of the Paris Agreement on Climate Change that Việt Nam ratified in November 2016, implementing projects to help local residents to adapt to climate change, issuing policies to assess and supervise green growth, and promoting green growth. Under the programme, several prioritised projects will assist local residents in coping with natural disasters, especially focusing on Mekong Delta, coastal provinces and northern mountainous provinces. About 42 projects to grow mangrove forests in coastal areas and protective forests in other areas will be implemented during the period. Phúc assigned the Ministry of Natural Resources and Environment as the lead entity responsible for coordinating with relevant agencies to implement the programme. The programme, worth VNĐ15.8 trillion (US$698 million), is financed by the State budget, local budget and other sources. HÀ NỘI — A major driver of the illegal wildlife trade in the Golden Triangle – the border area where Thailand, Laos and Myanmar – is tourists from Việt Nam and China. This was one of the conclusions of a report released on Thursday by the World Wildlife Fund to highlight ten of the Most Widely Traded Endangered Species in the markets of the Golden Triangle. The tourists are believed to travel to areas such as MongLa and Tachilek in Myanmar, and border areas such as Boten and the Golden Triangle Special Economic Zone in Laos. The report said tigers, elephants, bears and pangolin are four of the most widely traded species in the Golden Triangle. Rhinos, serow, helmeted hornbill, gaur, leopards and turtles round out the list of endangered species that are openly sold in a region that is Ground Zero in the illegal wildlife trade. The list is based on surveys by WWF of illegal wildlife markets, shops and restaurants, and reports from TRAFFIC and the Wildlife Trade Monitoring Network. The listed species are those most often seen for sale in a criminal trade that threatens wildlife across Asia and into Africa. The report also pointed out African rhinos are being poached at the rate of three per day to feed the demand for their horns in places such as Việt Nam, where the horns are mostly consumed as a symbol of wealth, as well as for traditional medicine.